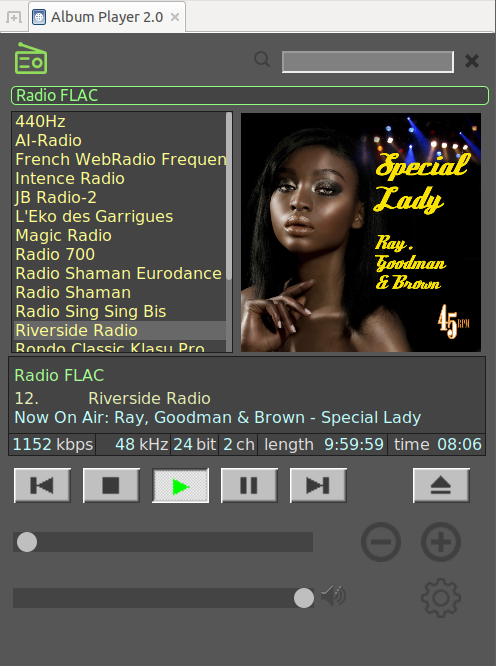 The Album Player for Linux is a free-distributed (Freeware) music file player for the Linux operating system (the x86, x64 and ARM platforms are supported). The player is designed for playback of music files, albums of music files, and compilations of albums from local disks or net sources, as well as for streaming listening to the Internet radio stations. The player supports the web interface remote control and the UPnP/DLNA renderer?s mode. The supported file formats are: WAV, FLAC, APE, WavPack, ALAC, AIFF, AAC, OGG, MP3, MP4, DFF, DSF, OPUS, TAK, WMA, SACD ISO, and DVD-A. The output of DSD files is supported in the DSD, DoP, and PCM modes. The player features an extended user access to settings of parameters and playback modes; it allows selecting and optimizing playback modes most suitable for listening to the music. The playback process is characterized with an exceptionally low resources intake. It results with less interference and better conditions for quality sound playback.